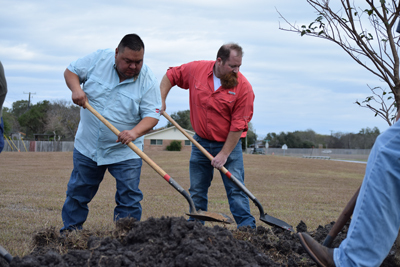 The Corpus Christi Parks & Recreation Department is responsible for overseeing 2,100 acres of developed and undeveloped open spaces (parks, City beaches, natural habitats, etc.) and facilities (recreation centers, pools, gyms, ball fields, senior centers, tennis and golf courses, etc.) to enrich the quality of life for residents and visitors alike. Your family and friends will have so much fun — from casting your fishing rod, riding your bike along the park, playing ball on the open field and so much more. Come throw some fajitas, hotdogs and corn on the cob on the grill. The Nueces Rivers runs along this park that has been a hot spot for many years during this holiday. ► See the FLYER for more details. ► View the Labonte Park Map with Campsites. ► The online reservation site is closed. ► Beginning Friday, April 19, 2019, any vacant campsites will then be reserved on a first come, first serve basis at Labonte Park. A playground where kids of all abilities can play! The Corpus Christi Parks & Recreation Department joins the Corpus Christi Housing and Community Development Department to invite everyone to celebrate the completion of phases 2 and 3 of the Play-for-All Playground at Salinas Park, located at 1354 Airport Road. Funding for this exciting new playground which offers fun accessible play features was made possible by the U.S. Department of Housing and Urban Development's (HUD) Community Development Block Grant (CDBG). Come on out to the park and bring your family to enjoy the playground and all the other wonderful park amenities. Come play! The City of Corpus Christi has received a national award from the National Community Development Association (NCDA) for the “Play-for-All Playground” project at Salinas Park. Project to be recognized in Washington D.C. in January 2019. On April 18, 2018, the ribbon cutting ceremony was held for The Water's Edge, our city's latest downtown bayfront park development, at The Great Lawn near McCaughan Park. See News Release for more details about the ribbon cutting event. Over 190 parks are listed by category and amenities in this document. Surveys indicate that parks are very important to residents and visitors—they enrich the quality of life and are a critical factor which impacts our city's economic development. This is a 162-acre nature preserve that is filled with life. We look forward to sharing the wonders of the natural world with you. We invite families, students, and nature lovers to explore the trails and learn with us or on your own. Visitors will learn about the importance of protecting this area now and for future generations to enjoy. Read more about the Oso Bay Wetlands Preserve. This program is a meaningful way for businesses, groups, and volunteers to showcase their commitment to the community. We hope you will join our efforts. The first step to adopting a park is to submit an Adopt-A-Park application form. Once you have selected a park and completed the application, submit a copy to Lisa Oliver at LisaO@cctexas.com, and the process towards adopting a park will begin thereafter. View the Adopt-A-Park Poster. Individuals, families or organizations can honor someone special in a loving and thoughtful way through our Commemorative Tree & Bench Program. With this program, you’ll have the opportunity to donate tree or bench memorials to celebrate a loved one within our beautiful parks. Learn more: Commemorative Tree & Bench Program brochure and Program request form. We are always looking for a few good men and women to join our Park Crews. This committee reviews and recommends a formal written plan to the City Council for the care, preservation, pruning, planting, replanting, removal or disposition of public trees. Learn more about the Tree Advisory Committee. The pier at Cole Park is closed for safety precautions. West Guth Park is closed for renovations.